Justin Gallegos, a runner at Oregon with cerebral palsy, thought he was just finishing another cross country race. Little did he know, Nike was waiting at the finish line to offer him a pro contract...check it out. Section6Runs and The National Comedy Center in Jamestown, NY is offering the Section6Runs community...student-athletes and their families, a promotional discount to the Center good thru January 31, 2019. When purchasing tickets online, use the promo code SECTION6RUN to receive the discount. Or, if you purchase tickets at the Center, print out this flyer and present it at the admissions desk. 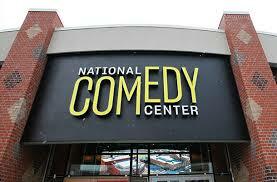 I have visited the National Comedy Center and spent about 2-1/2 hours there and could have spent the whole day. It is all interactive and it takes you through all sorts of comedy history and stories about past comedians. Visit the Hologram Theatre and watch comedian Jim Gaffigan tell you about his career...you'd swear he was standing in front of you. This is a destination you should not miss! Having the background and relationship with college coaches throughout the east coast and across the US, Coach Lombardo can assist the student-athlete and their families with their college recruiting process. This program is designed for student-athletes in the sophomore, junior, or senior year....click here to learn more. Section6Runs is looking for sponsors for its website to cover the scholastic year from September 1, 2018 thru June 30, 2018. I will place a banner ad on the main pages and throughout the photo galleries. Please contact me at bwende@section6runs.com. As I've done in the past, I'm seeking Section6Runs Spotlight candidates to publish on the Spotlight page. No criteria other than coaches submit a student-athlete by having the individual complete the questionnaire found on the Spotlight page. The questionnaire can be downloaded as it is in Word document format. Email (bwende@section6runs.com) the completed questionaire and include the file name of a photo image found on the Section6Runs photo galleries. If you cannot find a photo image, then please provide one. The image can be of the student-athlete competing or an informal portrait style image. Section6Runs reserves the right to reject any image deemed inappropriate. Please be advised that all 2018 XC season results can be found on the Section6Runs results page. The 2018 Section 6 XC Schedule has been updated with all major XC invitationals and CCAA, ECIC, Msgr Martin, NFL and Niagara-Orleans league meets and can be found here. Section6Runs photo galleries can still be found at http://section6runs.zenfolio.com/. I will NOT be at every meet as I will pick and choose depending on time and availability.